Naked-eye observations of NGC 4755 were not made in the ancient literature or southern cultures. Although easily visible by Ptolemy in the 2nd Century AD, no earlier reference has found. Perhaps this is not surprising, as unlike large open clusters like the Pleiades (M45) or Praesepe — The Beehive, or some of the bright southern clusters; the Southern Pleiades (IC 2602), NGC 2516 in far-southern Carina, or even M6 or M7 close to the tail of Scorpius; the Jewel Box is fairly small. In this paper is a drawn figure of Δ301 that Dunlop has, for some reason made very oddly distorted. Some of the stars do differ very slightly from how it appears today — even though Dunlop emphatically says; “Figure 13, is a very correct representation.” Also just as oddly is the missing central star of the bar, which is probably one of the most obvious features. It is also suprising that he hasn’t drawn Kappa Crucis itself as being the brighter star, while the bright blue star at the apex of the cluster seems too faint against the brightness of the other stars. These differences lead some to conclude that the cluster’s appearance had undergone significant changes ( See History of the Jewel Box Part C. 1860-1872. ), which is highly unlikely considering the slow proper motions of stars within open clusters and what we now know about the nature of stellar evolution over short timescales. Also within this text is an interesting remark that, according to Dunlop, the star is marked as “Chi” (χ) and not the Bayer/ Bode designation ‘Kappa’ (κ). Furthermore, this nomenclature continued until the beginning of the 20th Century, as several paper published by Francis Abbott, George Ellery and H.C. Russell, for example, still used the Greek letter χ or Chi. Of course, at least in regards the unorganised state of the ancient or medieval constellations, Crux was at one time or another was assigned as an integral part of Centaurus. 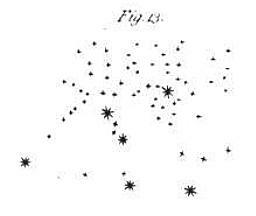 From about one thousand years ago, many of the bright stars of both Crux and Pointers became invisible in much of Europe by the slow effects of precession, and these stellar assignments were generally forgotten. This state of affairs continued into about the mid-17th Century, until at least, when several European explorers being travelling into the Antipodes. Although the usage of Chi was slowly discontinued, its use had not be properly extinguished even well after James Dunlop’s time. Today the modern 4.5 magnitude star Chi Centauri (14h 06.0m -41°11′) is placed some 19°N of β Centauri, which is nearer to the north-western corner of Lupus. John Dunlop here seems clearly wrong, making the same repeated simple error that persisted for some time. Though in all probability it can be more attributed to perhaps an older star atlas the Dunlop and the others had been using. It does seem that the southern observer H.C. Russell in the 19th Century might have become the first to correct it. In the literature search for this whole article, he was likely the first to refer to the cluster as Kappa Crucis in 1870. At present the lowest ranked Greek letter currently in use within Crux μ Crucis, which is also a wide pair suitable for binoculars. This similar quote has also been duplicated in several sources. I.e. Rev. Thomas W. Webb’s “Celestial Objects for Common Telescopes” Vol. 2, p.278 (1917). Herschel found the cluster very conspicuous, noting with clear admiration the great extent of the colours. Oddly, he described many of the component stars as “greenish”. This is immediately quite strange for an astronomical description, as green is both hard to see and rare — even among some of the bright and prominent colour-contrasting double stars. I can only conclude that Herschel is describing his overall impression of the stars rather than the individual stars actually being greenish. It is quite possible that Herschel is describing what he sees. Sometimes I wonder what may cause this is more likely the speculum mirrors, which under certain circumstances may differently absorb some wavelengths in reflecting the light — especially when the mirror was last polished to improve the mirrors reflectivity. Still the cluster’s given name has persisted till today, and it is possibly has become one of the most famous quotes about any southern deep-sky object. I counted some thirty-five sources with the same, or oddly, slightly varied wordage. The ‘Jewel Box’ name still conjures up much to the cluster’s mystic, and in turn, produces much interest about the southern skies. In most of this period the information on the cluster remained similar and generally written for popularity among visual observers. This probably concluded by the time of Dreyer in 1888, who published the deep-sky New General Catalogue — scientifically classifimg the Jewel Box among the other clusters as ‘cl, vl, stvb, kappacrucis’ — Cluster, very large, stars very bright, surrounding Kappa Crucis.